By MosaicManiac, June 1, 2009 in Plugins - Publishing ONLY! 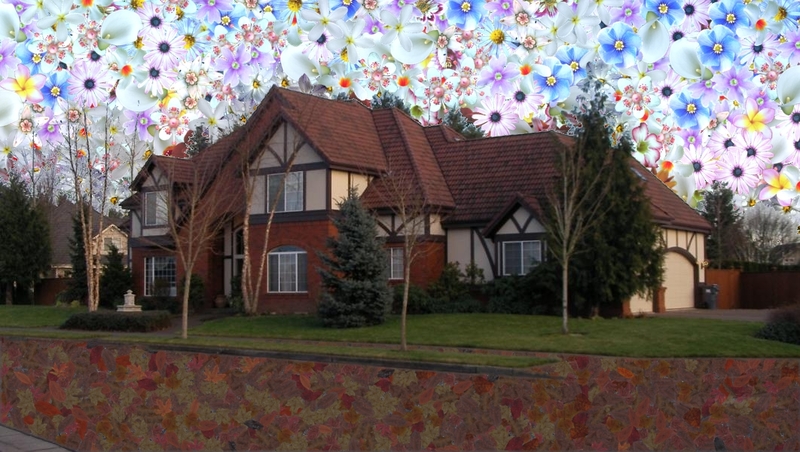 I'd like to introduce a new plug-in I call "Mosaic Maniac Collage Paint"
This is an early release and I still know of a couple of bugs, but do let me know if you find some. I'm interested in your comments and suggestions. Did you ever want to paint using more than a single color or image? Now you can paint with whole collections of images. The plug-in creates a unique non repeatable pattern that closely tries to match the background. 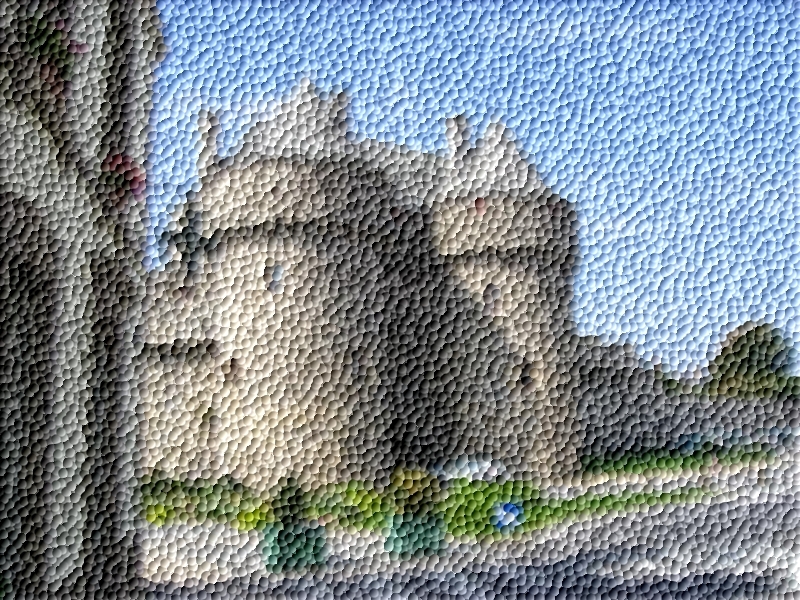 Image distribution is based on latest pattern recognition and image matching techniques. Shapes, colors, brightness, as well as many other factors determine where the image is placed. This is an example of pattern collage. 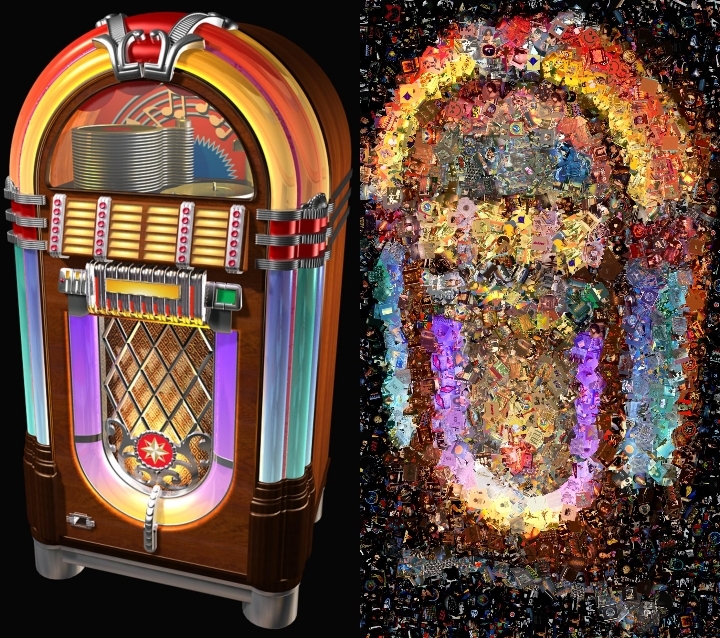 The main image of a Jukebox is painted over with collection of music album covers. Notice how the dark images cover the dark areas, yellow cover yellow etc. Select an image we will paint on. Using Magic Wand, select an area to paint on. 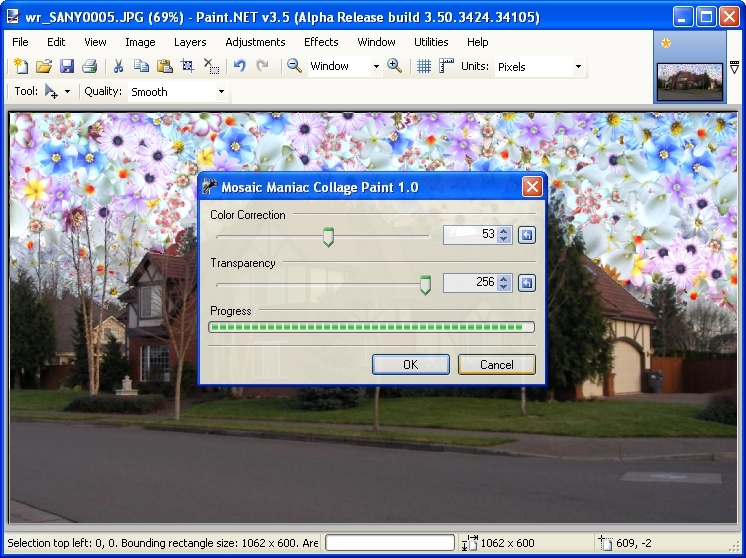 From Effects menus select "Artistic" and "Collage Paint"
You will see a "Mosaic Maniac Collage Paint Options" dialog. Browse for the folder containing your images. All images in the folder will be used. If you want to use only certain images you'll have to create folders and copy only the images you want to use. 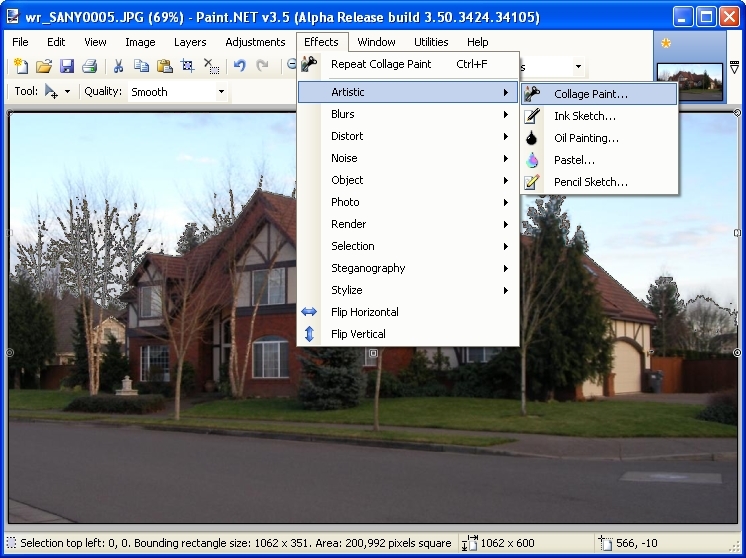 All images are sized down and only their thumbnails used in pattern painting. "Maximum image size in pixels" textbox specifies that size. Leave the "Rotate images" checkbox checked. All images used will be rotated randomly. 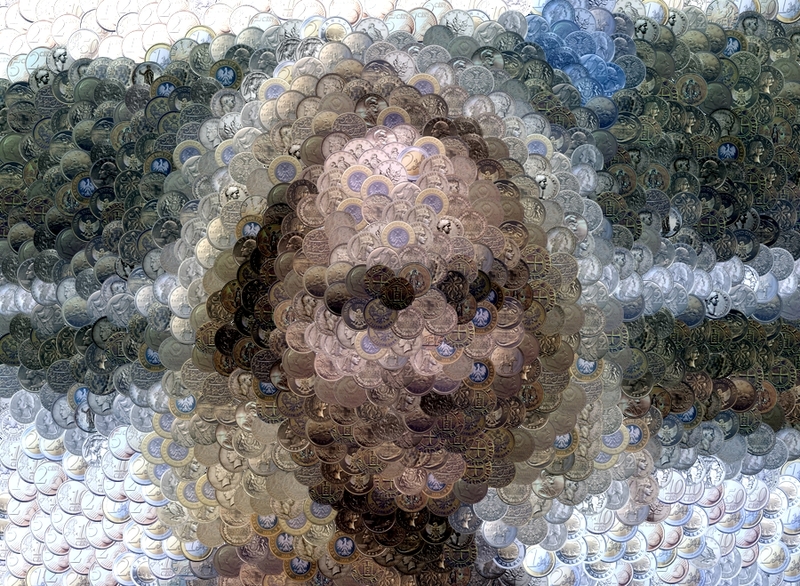 Uncheck this field if you are painting a photomosaic. Adjust Hue and Transparency for the desired result. Hue Adjustment requires reprocessing and takes some time. Put some leaves on the road and we really managed to mess this nice picture up. PDN 3.5 Alpha should work now! copy it to C:\Program Files\Paint.NET\Effects directory. Hey, what a great plugin you made there ! I really enjoy it very much. But you must take care of the folder's size .. I had to wait 22 minutes on my first trial, using a folder containing 800 images ! perhaps you should put this under artistic. the effects menu is really over populated. I come a second time, just to inform you that your plugin cannot be used on 3.5 Alpha PDN version. Message d'erreur : PaintDotNet.WorkerThreadException: Worker thread threw an exception ---> System.InvalidOperationException: Opération inter-threads non valide : le contrôle 'MainForm' a fait l'objet d'un accès à partir d'un thread autre que celui sur lequel il a été créé. Thanks for the bug info. I'll take a look at it later today. It does not work with PDN 3.5 alpha and will not anytime soon. Well, that'll be a problem. When 3.5 becomes stable, this plugin will no longer work, and all users will be forced to upgrade past it. In addition, it will no longer be allowed to be hosted on the forum, as it will require a legacy version of the program to operate. I'd recommend you eschew new features in favor of making it work with 3.5. At least when the Stable comes out, and probably when the public Beta/RC comes out. It's an awesome plugin, don't let it die. By all means 3.5 and all future versions will be supported. I'll do what it takes. I've spent some time already working on it and I see there are some significant issues to be resolved. I'm hoping 3.5 Alpha is just that - Alpha and the final release will not divert so much. Excellent to hear. :-) Good work. Thank you for all your suggestions. I think I addressed them all. Please do keep them coming. All images used in the examples on this page can be downloaded from http://mosaicmaniac.com/?c=TabDownload under "Rendering packs"
When I tried it it worked but I got several "read and write protected memory" errors. Is there a chance error messages could be displayed in an errors textbox rather than a model dialog? Also, using SubMenuNames.Artistic would change the name "Artistic" to the label in the language PDN is localised to. Bug: Click "OK" while the collage is rendering. Thanks for the plugin update that works perfectly well on 3.5 Alpha. Thank you Simon for "kicking the tires”! You found a couple of good issues. Clicking OK during surface preparation is really not OK, you'd get some errors. I'll have to disable that. SubmenuNames.Artistic is a very good suggestion. I wouldn’t know it's there if you hadn't told me. New release is coming soon. I have my interface set to a different language to test my plugins for things like that. Here is another update - version 1.0.0906.07. This release include fixes for the issues Simon talked about yesterday. Is it a release candidate? Yet another version - 1.0.0906.08 is up for grabs. I've just downloaded this. After I finish my Elephant picture I'll give this a real workout. I suggest that you provide some sample images for mosaic painting in your first post - like those flowers. That will help the users, as they can play around with your plugin and get an impression how it fits their needs. And indeed, this plugin looks amazing. Thanks! this looks amazing. now that it has 3.5 support im dling. I think this is a bug, maybe its only for me. If you have a transparent new image, It will not work. So an 800x600 of transparent pixels, use your effect... no result.